Donald Trump has repeatedly argued that Elizabeth Warren is unfit for the presidency — because she owes her success to lies and unearned advantages. Specifically, Trump has claimed that the Massachusetts senator fraudulently identified as Native American during her career, as a means of exploiting affirmative action in academic hiring. Thus, the president has dubbed her “Pocahontas” — and, in June, vowed to donate $1 million to a charity of Warren’s choice if she could produce a DNA test showing that she did, in fact, have indigenous heritage. On Monday — in a move that makes her presidential ambitions unmistakable — Warren released a test that appears to do just that. 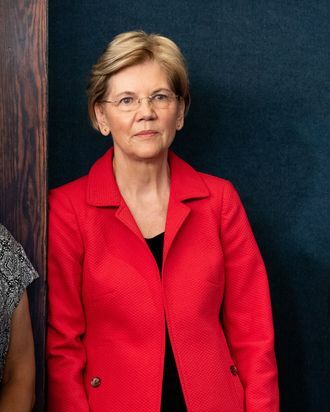 According to an analysis from Stanford genetics professor Carlos Bustamante, Warren’s genetic makeup strongly suggests that she had a Native American ancestor between 6 and 10 generations ago. That might seem like a thin reed on which to found an ethnic identity. But in Warren’s telling, this distant genetic inheritance had profound implications for her immediate family. As the senator explains in a video announcing the DNA results, the fact that her mother came from a family that (purportedly) had indigenous “blood” caused her father’s parents to oppose their relationship. Which is to say: Warren identified as Native American because that was how many people in the (profoundly racist) society of early 20th century Oklahoma identified her mother. The senator has told this story many times before. The DNA evidence merely lends credence to the notion that Warren’s indigenous identity derives from the social stigma her mother faced. More pertinent to Trump’s attacks, Warren’s video highlights the conclusions of a recent Boston Globe investigation, which found that her claims of Native ancestry played no role in her ascent to the heights of the legal profession. A large archive of university documents demonstrate that the hiring committees at Harvard Law School and the University of Pennsylvania viewed Warren as a white woman. One can still reasonably object to Warren’s decision to identify as Native American, despite lacking membership in any tribe, or an indigenous ancestor in living memory. But if you accept her account of her parents’ marriage, then her unconventional claim to that identity is rooted in sentimentality, not cynicism. Regardless, the remarkable trajectory of her career — which took her from being a young mother attending a commuter college to Harvard Law to the Senate — was a product of her own talents, grit, and luck, not her ethnic self-identification. Warren is now calling for Trump to make good on his promise, and donate $1 million to charity. In all likelihood, the president (who built a fortune off inherited wealth, tax evasion, and bait-and-switch schemes) will shirk that pledge, and continue insisting that Warren is a fraud who did not earn her success.